Mmm … Strawberry ice cream! Strawberry – one of the world’s most popular ice cream flavours! My children certainly approve, and when serving this ice cream to them and their friends, I have often noted that other parents present serve themselves some too (sometimes rather discreetly), even if more “adult” flavours are at hand. While strawberry ice cream perfectly well can be prepared in both the French and the Italian styles, I must confess a certain weakness for using the plain American (Philadelphia-) style when it comes to fresh strawberries. The taste of the berries comes across in a very “natural” way, bringing about nice associations to (admittedly, idealised) images of ice creams of my childhood, and simple, unadulterated nature. Another major advantage is the speed of preparation – no cooking of the ice cream base means that it can be prepared and put to churning/freezing in almost no time at all. 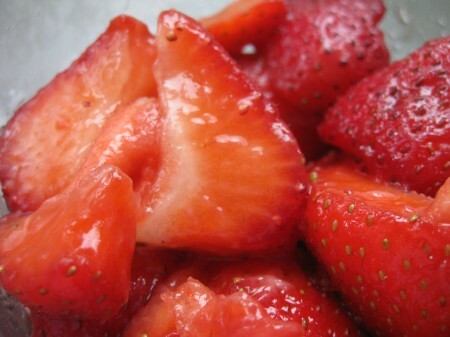 Begin with the strawberries: Hull them, slice them up and mix with about 100 ml (0.4 cup) sugar and the juice of 1/2 lemon. Put aside in the refrigerator, preferably for a few hours, shaking up the strawberries-sugar mix a couple of times. You have now macerated the strawberries! Purée them with a mixer and return the purée to the fridge to (continue to) chill. Whisk together the cream, the sugar, and the milk. When thoroughly mixed, add the macerated strawberry-purée and blend well. Freeze in your ice cream machine according to instructions, or go here for instructions on how to make the ice cream without a machine. The ice cream certainly comes into its very fresh own when eaten almost right away after churning – something that rarely has proved problematic in our household. Ordinary strawberry ice cream too “childish”? Want something slightly more complex and “adult”? Adding 1-2 teaspoons of Kirsch will enhance and deepen the natural flavour of the strawberries. Going further away from the “natural” flavour of strawberry, you could also try to add about 1 tablespoon of (high-quality) balsamic vinegar to the strawberries. 1-2 tablespoons of the orange-flavoured liqueurs Grand Marnier or Cointreau would also go well with strawberries. If you would like to increase the smoothness of the ice cream (and increase the stability and storability), the addition of 1-2 eggs/egg yolks to the recipe above would likely do the trick. If you would like to try this, whisk the eggs/yolks together with the sugar, then add that mix to the cream and the milk). If, for some reason, you would prefer not to use eggs, corn starch also works very nicely in strawberry ice cream, while maintaining the flavour-focus on the strawberries. Please check here for a base recipe to use! 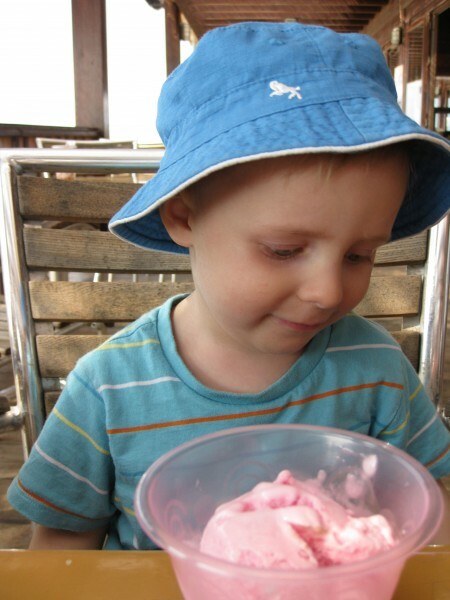 I made this strawberry icecream some little time ago – and it was VERY good with a very strong strawberry flavour. However yesterday, I made it again — but was tempted by a recipe elsewhere to “cook” the strawberries rather than simply macerate them. This worked well and produced basically strawberry jam — BUT this proved to be disappointing in the ice cream . It tasted of strawberry but was not a strong taste as was the macerated berries recipe. Yes, using jam instead of fruit (or, for that matter, boiling fruits into purées) often create quite a different flavour (less natural and more “cooked”, which – of course – is perfectly logical). Using jams in ice cream can still be quite nice, but for strawberries I also prefer the untreated, macerated berries. can both eggs and corn starch be used in this recipe? and does the eggs needed to be heated? You could certainly use both eggs and corn starch, and I strongly encourage you (and other readers) to play around and see how that turns ut! As noted in the post, just be aware that adding eggs and/or starch will change the type of ice cream you would be making. As this strawberry recipe is a typical American (or Philadelphia-) style ice cream, adding eggs and other stabilisers will bring it further towards custard-type and/or starch based ice creams (check the links in the post if you want to read up on those). However, Ben & Jerry recipes for home-use often use an added egg and many would argue that even a single egg can add to the overall tasting experience. Whether you would need to heat the eggs while preparing the ice cream base depends on your food safety-situation. Raw, unpasteurized eggs can be quite dangerous, especially for more vulnerable persons (like the pregnant, young children, the elderly) so if in doubt, it is clearly best to perform a “pasteurizing” cooking session: you can check out any of the recipes using custard bases for advise on how to do it, and what temperatures to go for. Best of luck! I like your articles and recipes.I am from India and its very difficult to fine fresh strawberries here. Can I use frozen berries and fruits in gels instead. This recipe does not contain emulsifiers or stabilazers,so would like to know how is the texture or mouthfeel of the icecreams. 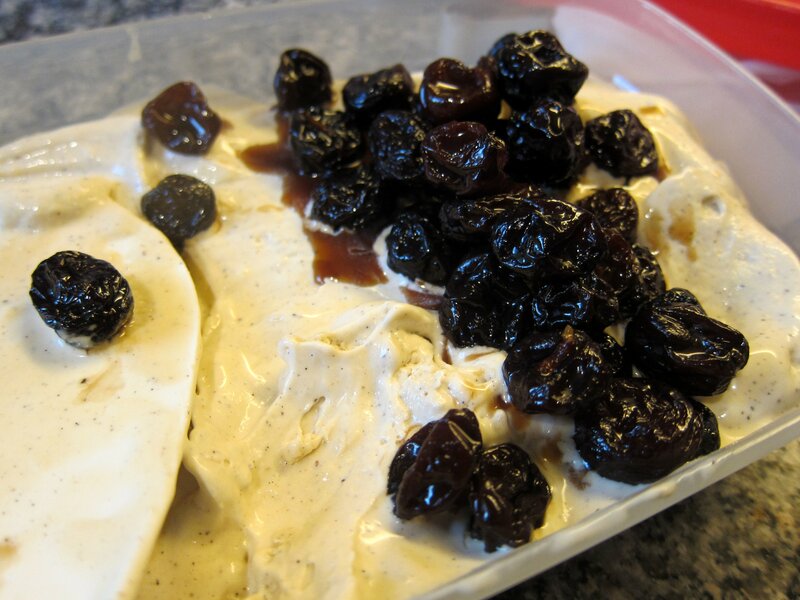 Glad to hear you like it here on the site:-) You can certainly use frozen fruit instead of fresh ones! 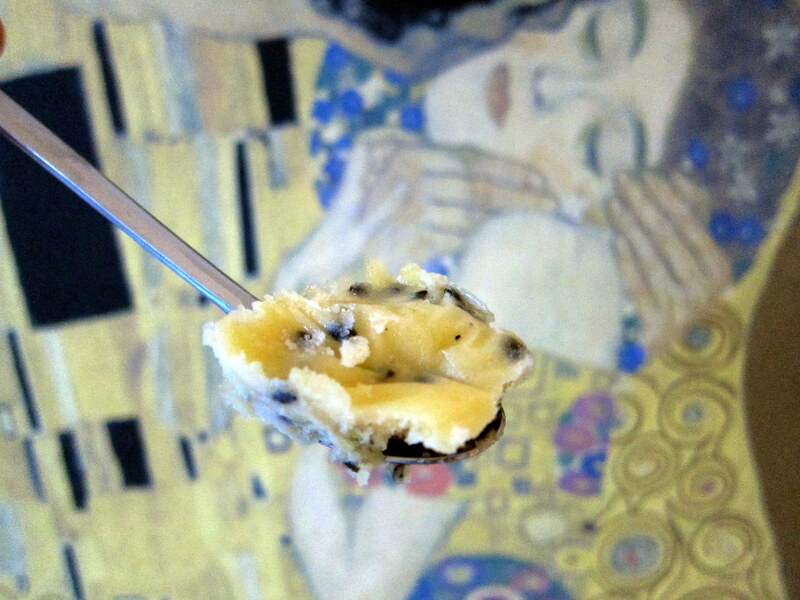 Mouthfeel and texture is fine: the cream (or rather, the fat it contains) takes care of that in American-style (Philadelphia-style) ice creams. Should you like to improve on the texture further, you could add egg(s) or starch to the recipe. Thank you! This simple recipe made the tastiest strawberry ice cream ever! Do you have a recipe for lemon gelato using cornstarch, whole milk and NO eggs or cream? You can make one yourself by using the Sicilian gelato-base recipe (or its “cousin”-recipe, which uses arrowroot instead of cornstarch). Since lemon juice won’t add any solids (the stuff that helps to build a nice consistency to an ice cream) I would strongly suggest that you also add (quite a lot of) lemon zest for flavouring. Your “milk-only” ice cream will contain enough water already, even if the starch should be able to balance things out.